C3-540 CORIOmaster is a powerful, efficient approach to building large video display systems. 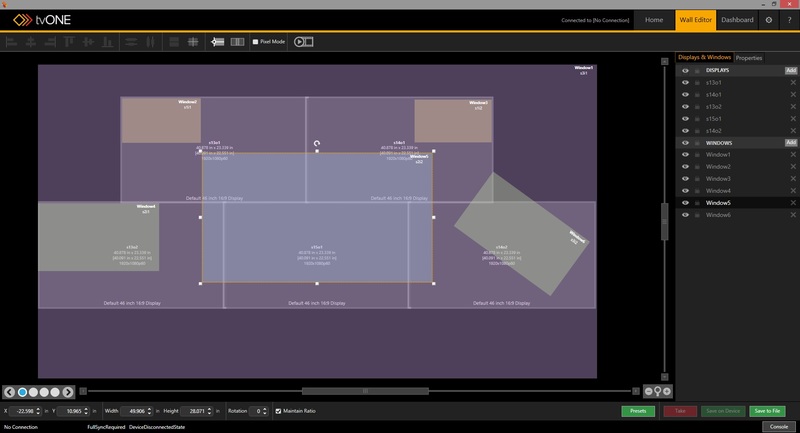 Multiple video windows can be positioned on LED, display based videowalls or projector edge blends, displaying any of the sources connected to CORIOmaster. Windows can be visually “transitioned” into position, resized or rotated to any proportion allowing designers to achieve striking visual effects. Each system can support up to 4 separate video canvasses. CORIOgrapher v2, the control software for the CORIOmaster series of processors, is a simple, easy to use design interface that enables window and source positioning and transition eff ects. This dynamic feature is easily managed through presets in CORIOgrapher or by simple commands executed by third party control systems. 50 presets can be saved permanently in the system. Secure Communication mode – The latest CORIOmaster release provides a mode to encrypt all networked based communication through AES128 encryption to provide private communication in mission critical applications where network security and authentication is essential. REST API / WebSocket - Based on industry standard schema, CORIOmaster supports REST API providing multi-user communication to device. Integrators can now subscribe to a growing range of events to provide real time feedback from CORIOmaster (such as: HDMI handshake, lost source, USB stick removed, etc). These events can be used by a control system to automatically monitor the performance and events of the videowall and respond accordingly. Multiple control points - Using our REST API up to four users can now control a single CORIOmaster chassis simultaneously making programming, control and fault finding a dream. In addition to control via CORIOgrapher,simultaneous control is possible using the CORIOmaster app (IOS and Android) and by a third-party control system using our real-time API interface. CORIOgrapher login profiles – System administrators can set different levels of control for up to four user profiles for Power User and User access control. together with audio mute gives full control. Higher bandwidth support – A doubling of the module bandwidth to 100mbs means you can de-encode two network streams up to 4k 30 @ 50mbs in to just 1 slot. Increased bandwidth is also available for media playback up to 80mbs on a single channel for increased quality content and interoperability. H.265 Support – H.265 streams offer higher quality with file sizes of around half that of a H.264 stream. applications in conjunction with the Magenta Encoder-100. CORIOmaster video walls onto mobile platforms. Download it here. The addition of 4K support consists of two modules; HDMI 2.0 4K60 input module and the HDMI 1.4 4K30 scaling output module. CORIOgrapher v2, the control software for the CORIOmaster, CORIOmaster mini and CORIOmaster micro videowall processors now has included simple easy to use window and source transition effects. This new animation feature is controlled by presets in the system. Transition effects occur not only by selecting presets in CORIOgrapher but also by third party control systems. Spin – Both left and right rotation up to 7 times in either direction with source change in the middle of the duration. Rotation – Windows can be rotated independent of Source Spin in 359º/+359º. Movement – place a window in the desired location on the videowall. When a preset is recalled the transition parameters will automatically occur and be smoothly applied over the duration set in each preset from the current state of the windows. Presets can be created and selected sequentially for precise control of desired effects. Presets can also be selected randomly with the CORIO firmware automatically calculating the difference from preset to preset. Watch the video link below and contact us to learn more! CORIO3 video processing technology makes the designing of creative and powerful video display systems an entirely visual experience. Users create Layouts or virtual display groups on a PC screen and then select sources to show on those virtual displays. Then it’s a freeform process of creating a Canvas over the display Layout by sizing, shaping, rotating and positioning each source as required. CORIOgrapher v2 is the powerful software behind the CORIOmaster. Learn more about CORIOgrapher v2 here. The Streaming Media Input Module provides CORIOmaster systems with the ability to bring 2 network streams up to 1080p 60 @ 25mbs in to just 1 slot. The 128GB SSD module provides 128GB internal memory for storage and playback of local content on video display systems. The module also enables H.264 video steaming capability for CORIOmaster systems. Designed to pair automatically with CORIOmaster processors, the Encoder-100 allows for encoding and streaming of high-quality video and audio over standard IP networks. The Quad HDMI scaled output module allows you to produce up to 56 1080p outputs with your CORIOmaster C3 540. The CM-AUD-2IN-4OUT is an audio Input and Output (I/O) module for CORIOmaster (C3-540) and CORIOmaster mini (C3-510).